Born into House Tully of Riverrun, Catelyn Stark was initially introduced to audiences as the wife of Eddard (Ned) Stark, as the Lady of Winterfell. Her marriage to Ned was arranged, but it’s clear from the beginning of the series that this is an arranged marriage that has experienced unique success; the love between Catelyn and Ned is apparent, and they have a brood of handsome children as proof. Proud, strong, kind, and generous, Catelyn also flexes her political and diplomatic skills after the death of her husband and the ascension of her eldest son, Robb, as the King In The North. Like other prominent female figures in Westeros (especially as a foil for Cersei Lannister), Catelyn is predominantly guided by the desire to protect her children. Little good that does Catelyn. Little good that does for Cersei, for that matter. Despite her abrupt and tragic end, fans of the novels were hopeful that Catelyn would be resurrected (as she was in the books). None of us would be so lucky, it seems, but actress Michelle Fairley won critical acclaim for her final performance in “The Rains of Castamere” in season three. We love and miss you Catelyn. Let me know what you think about House Stark in the comments. And don’t forget to Like LenseBender on Facebook and Follow Me On Twitter. Today’s “Fallout” easter egg is a simple one, but it’s also one of my favorites. To the uninitiated, there’s a location on the map in The Capital Wasteland where people have survived, barricaded behind a mountain of k-rails, slabs of salvaged pavement, and the walls of a lone surviving structure. Tenpenny Tower, a rotting spire of concrete named after it’s founding inhabitant, is a fortified settlement in the territories west of the Downtown DC ruins. Formerly a luxury hotel, it is the tallest surviving building on the map, with the Washington Memorial a likely second. For those of you who don’t know – and if you don’t, the why the heck are you even reading this?! – ghouls are humans who have been deformed due to exposure to high levels of radiation. Some ghouls are feral and will attack anybody on-sight, but there are underground societies of mentally acute ghouls. These are perfectly sound, rational human beings with a serious case of flesh-rot. Prejudice against them is rampant in settlements across the wastes because of their unsightly appearance and fears that they may become feral. Their presence in the “Fallout” universe is a clever way to inject themes of racial prejudice into the narrative without invoking actual real-world ethnicities. On the mid-floor apartments in Tenpenny, there’s a tricycle in the hallway, along with blood-stains on the walls and an overturned chair. This is a direct reference to Stanley Kubrick’s classic horror film “The Shining,” based on the novel by Stephen King. 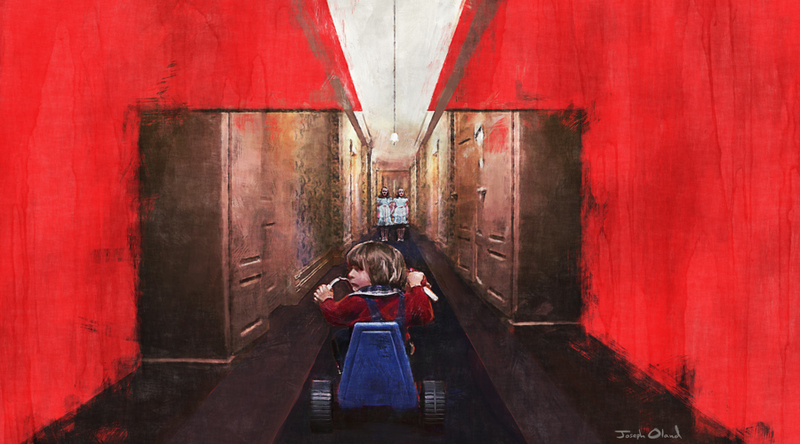 Midway through the film, Danny Torrence happens upon two little girls dressed in blue while riding his big-wheel through the corridors of the hotel. In a flash, Danny sees a murder scene with the two girls laying on the ground, butchered, with blood covering the walls and an upturned chair on the floor. Little nods like this are everywhere in the “Fallout” universe, but this one is absolutely marvelous. Bonus Game Fact: Emil Pagliarulo, lead game designer and lead writer on the “Fallout 3” project confirmed that Tenpenny Tower (and its associated game quest) was partially inspired by Fiddler’s Green, the skyscraper in George A. Romero’s “Land of the Dead.” The story line is similar enough, with arrogant elites inside, and ghoulish creatures outside, looking for a way in.